I'm pretty sure I've downloaded every work out and fitness app available. It's an ongoing saga. Some weeks, I'm using Fitocracy and that's fine (except it doesn't list calorie counts, just arbitrary points). Some weeks, I just track my cardio work outs on LoseIt. I've downloaded all kinds of apps that claim to build awesome work outs (pro tip: none of them do). A few weeks ago, someone recommended I download PumpUp. They recommended it mostly for the community, but briefly mentioned that you can build work outs on it too. I was intrigued. I downloaded the app and forgot about it for a few days. Cut to a few days later. At work, I opened the app and selected the plus button which brought up the basic menu. I could Start a Workout, Log an Activity, Track my Weight, or Share a Photo. I hadn't been impressed until I discovered I could create work outs. My frustration with other workout generating apps centered around the fact that the workouts just weren't good. I can do 20 lunges on my own. I don't need an app to do that. I needed an app that could create workouts for a specific amount of time for a specific goal. PumpUp does that. It's great. All the workouts I've created, including what I've scheduled for the day. 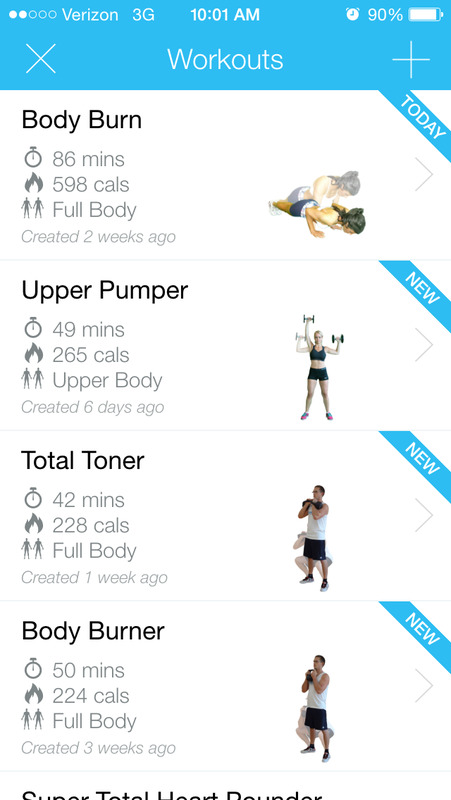 When you select a workout, you can browse through all the exercises. 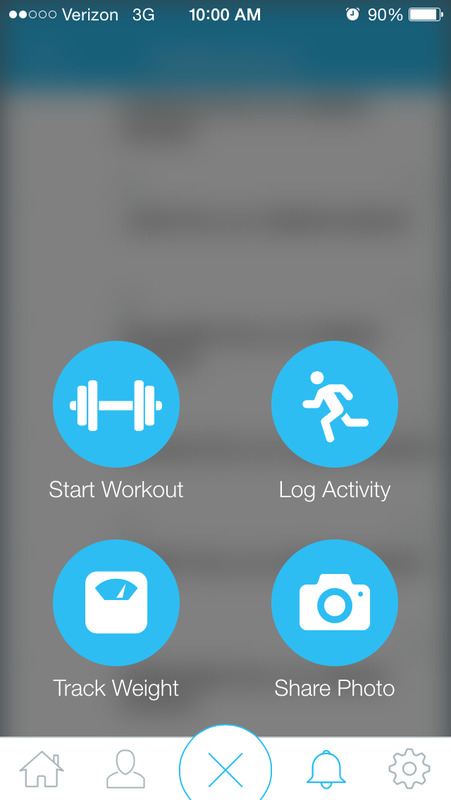 After you select start now, it times you and tracks your calories. If you need to do 2 minutes of stretching, it times it. The workouts are so nice. I like that it demonstrates how to do each exercise and allows you to swap out exercises. If you did dumbbell squats yesterday and your legs are still hurting, you can swap for lunges or a similar exercise. It's like a workout video, but without an annoying instructor. Just you and the app. Each section is colorcoded. Yellow is warmup; orange is strength; green is circuits (if you've chosen to add conditioning to your workout); dark blue is cardio; and purple is your cool down time. Each strength section, rep, and circuit are separated by timed breaks, so you're forced to give your muscles a rest. (I'm really bad at taking breaks.) It always times your cardio. The interesting thing is that cardio is set after your strength-training; the app explains they do this because research shows you burn more fat that way. That sounds good to me! Mostly, I love the variety. When you create a work out, you can select what you want to achieve: to tone up, to lose weight, to get healthy, whatever. Then, you can select if you're at home, in a hotel, or in a gym. Then, you can select what equipment and machines you have access to: dumbbells, bands, cardio machines, etc. It then takes everything you've told it and spits out a workout in the time frame you requested targeting the muscle groups you indicated. Already I've noticed a change in my workouts and my body. I feel more satisfied when I leave the gym and I've noticed an increase in my strength. I'm up to using 10-pound weights (instead of 6-pound or 8-pound) and I can now do 12 real pushups. I've never been able to do a push up in my life. I've always toyed around with buying fancy videos or programs, but when you can create effective workouts on a free app, really, what's the point? It's so much more convenient, especially if you already pay for a gym membership. PumpUp combines everything I wanted in an app. I'm disappointed it took me so long to find it. As long as I ignore the community aspect, I can get everything I want in my workout from a single, free app on my phone. What's more perfect than that?